Got this from the publisher (cdbaby) and it arrived a few weeks ago. I have to confess that Walter and I were high school classmates but he never solicited me or anything like that. I didn't even know he had cut a few cd's. I am an author and I don't solicit him to read my stuff either. I plan to surprise him with this review. I have to drive a lot and usually I am singing along with Foghat, Foreigner, The Kinks and Deep Purple in my car. My wife and I car pool often and she gets annoyed sometimes at the blasts. I put Many Splendid Things in the CD player on the way home as a surprise and when it started my wife sat up and said, "hey this is very soothing". By the time all the tracks were played she decided it was pretty darn good and "very pleasant". We listened to it every day on the way home. I have a friend who plays jazz piano and he heard it as I was pulling into his portacochere and noticing it was nothing like my usual sound, he asked to borrow it. I have yet to get it back. He gave it to his doctor to play in the waiting room (he hates the doctor's choices) and some of the folks remarked favorably about it according to my friend. I have yet to get the CD back and I am going over to the doctor's office tomorrow and taking it back. I miss it. These are for the most part Walter Clark's renditions and rearrangements of old familiar tunes The first track (Lorraine) is very upbeat and has a "swing" to it. His Tennessee Waltz ending actually made me share the pain of the love loss that must have inspired the original lyricist. While a lot of folks deem it blasphemy to change old favorites in any way; Walter did a great job enhancing rather than losing their timeless charm. It was like hearing old friends who have aged and matured but you still know who they are. When I get it back my wife and I plan on sitting on our lanai and popping a bottle of wine open. While we watch the sun descend into the Pacific and the sky gives way to the Galaxy that special ambiance of the night with the sounds of sweetly ripened, vintage tunes will enhance our shared visit with these old friends courtesy of a very talented classmate. 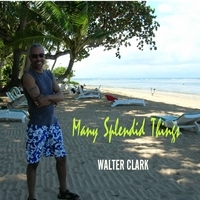 Do yourself a favor and buy these CD's by Walter Clark. Discover a truly unique artist. You are sure to like the broadened personality of some old friends. It was one hell of a coincidence to me that after I wrote to you yesterday, there was a wonderful surprise awaiting me in my mailbox. I don't need to tell you it was "Best Thing To Come", to which I am listening at this very moment. This thing is DYNAMITE! First of all "Destiny " is so beautiful and well executed it almost made me want to cry. What kind of piano was that? It must've been a full fledged genuine Bosendorfer (or something like that), right? I was just about to say the artwork, especially the cover, is enough to make the cd a success right there. And now I see it was done by June. She's absolutely phenomenal! What magnificent talent! on mixing and mastering yourself. Mike wrote: "Silky Smooth Baby!!!" you let God into your life.Ain't it grand.Stay health,cherish peace of mind,and stay with the Lord. Neal Yermish commented on your Wall post. Neal wrote: "Walt, I loved the CD and I'm waiting for Amazon. I'm still "old school" and like to hold the disk (and copy it onto all my pc's & ipods)"
Well, my brother, Walt, I'm still listening to that true masterpiece that is your new CD. Speaking of Amazing, the bass work on #3, Amazing Grace, was certainly amazing. What is that called, sampling an acoustic double bass or what? A great and unique intro and interpretation, so much so that I had begun to doubt whether it would be the same song usually associated with that title. #4, Lovely Day. Very spry and upbeat. A "feel good" song to be sure. Simply and refreshingly beautiful! Again, truly hellified bass work too! Sounds like you've got ten live, individual, in-the-flesh musicians with you on that song, and you do a superb job of harmonizing with yourself on the vocals. You even said "Hit it", at the very end of one of the last tags, as though you were talking to other musicians present there with you. Splendid! More later as I continue listening. Right now listening to the very touching and very romantic #5, She. Thank you for emailing me, I'm very happy to get a mail from you. I enjoy your CD with Yui everyday before we sleep. If you do special concert, please let me know and I must go! We are touched with your performance. This is a wonderful cover album. The focus of the originals are maintained, yet expanded with Walter's approach. Sweet Loraine is my favorite. Tennessee waltz is a big surprise. Buy it. You will like it. As will your significant other. i really really really love this CD Walter!!! yur sweet low voice and smooth music you play......how pleasant to my ears!!! at the Narita Airport port on Jan 30th. It was a pleasure to meet with you and your family! Thank you so much for the prompt shipping. we will come see your gig! Good luck with everything. Take care. Hello! I really enjoyed last night. Thank you. I am listening to your cd nowl I really love this. I'd like to hear your voice again. Do you play at Nikko hotel tomorrow? Your CD is very nice. My wife is very glad! My home is very happy! Walter, when you said your CD went out today I guess I I didn't know I'd get one too! I took some time to listen and of course the venue is closer to my taste than your first one. In comparing, there's a vast difference in the recording quality this time: much more clarity. As usual, it has the Clark signature all throughout. Simply magnificent! I listen to your CD everyday! Love it! Thanks for your warm hospitality the other night, my team and I really enjoyed your music and your CD isn't half bad either! smooth voice. Listen to this CD, you wont be disappointed! I got Walter's fabulous CD a few years ago and have enjoyed listening to it many, many times since. It is truly beautiful music from a beautiful musician. first impression: nice work! Congratulations! despair? I like that this one ends on a positive note. virtual walk in the moonlight, romantic guitar, and violins. Walter's ardent crescendo is never over the top, just right. customers, hand dancing the night away and taking care of business. a live horn solo that adds body just where we like it. of tempo with which Walter accompanies several beautiful melodies. existence in a manageable world. I had a chance yesterday to listen to your CD while enjoying some Dave time. I got your CD yesterday. Otsukaresama & Thank you! Your voice is simply excellent! Thanks for sending us your new CD. We really love the songs and we are adding it to our regular rotation of music that plays in the store. We really appreciate your kind gesture. Sara and the Suzannes.com team. Great CD! I had to come back and pick up another copy though. My wife took the first one I got. She keeps it in her car and I hadn't heard it since. I bought your album and just wanted to tell you how much I enjoy listening to your CD in my car. Thanks! Its great! Re: "The Nearness of You"
yo bro... that was a nice arrangement! Thumbs up!